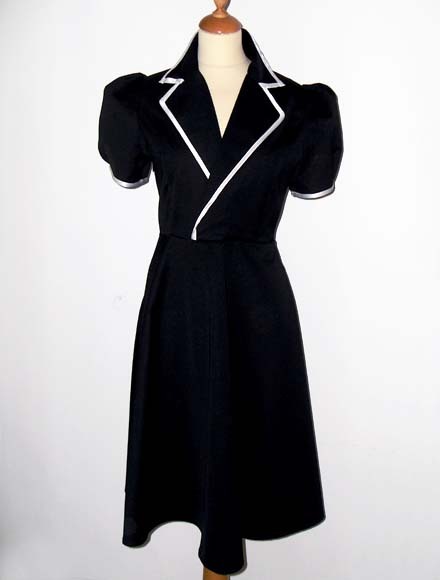 New item on the website: retro pin-up black&white tailored dress. 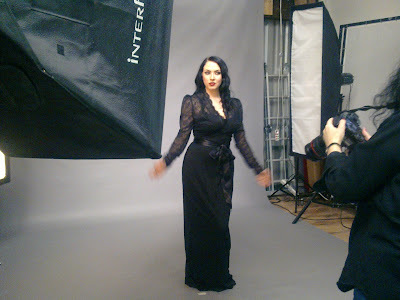 This is one of the pics of that photoshoot (more pics coming soon) and I designed this gorgeous gown just before the shoot so I wanted it to be included. 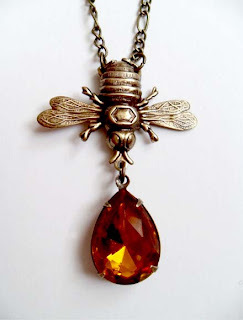 I think it will be a gorgeous piece for any smart occasions, including weddings. 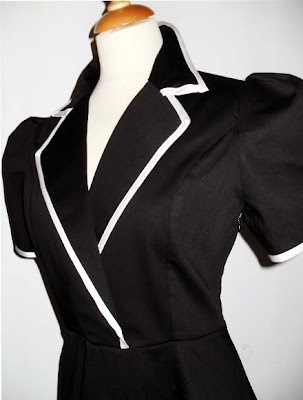 It is sooo darkly elegant, it is sure to be a staple piece in Morticia's black wardrobe. What do you think? The stunning model is Whiskey Raven and the photographer is the talented Glo Mason from InaGlo Photography. 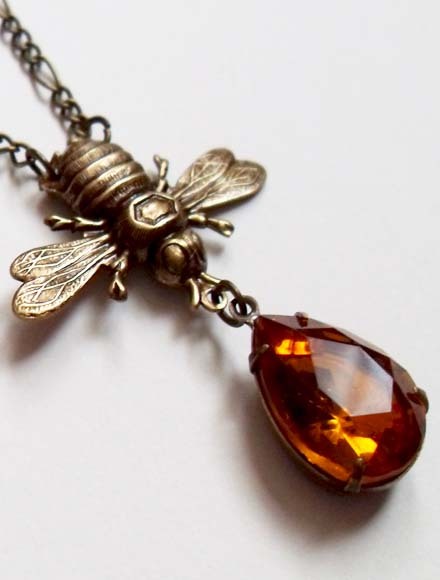 (Links to their facebook pages are on their names). As I am in full swing developing my Spring/Summer collection and sewing like mad I got distracted looking at the dark beauties we may expect wearing next Winter. I must say, I'm excited. 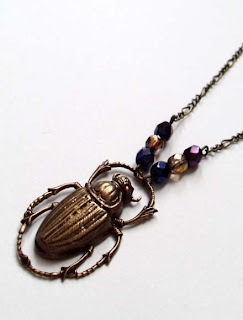 Lots of Dark Dark pieces! 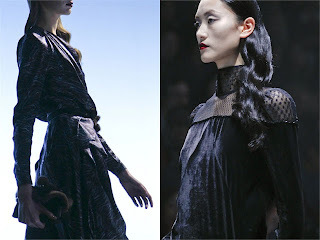 (and I'm not talking about plain black, I'm talking about opulent velvet and decadent gothic symbols as well as distressed textures and luxurious brocades and dramatic laces). I'm drooling just thinking of it. 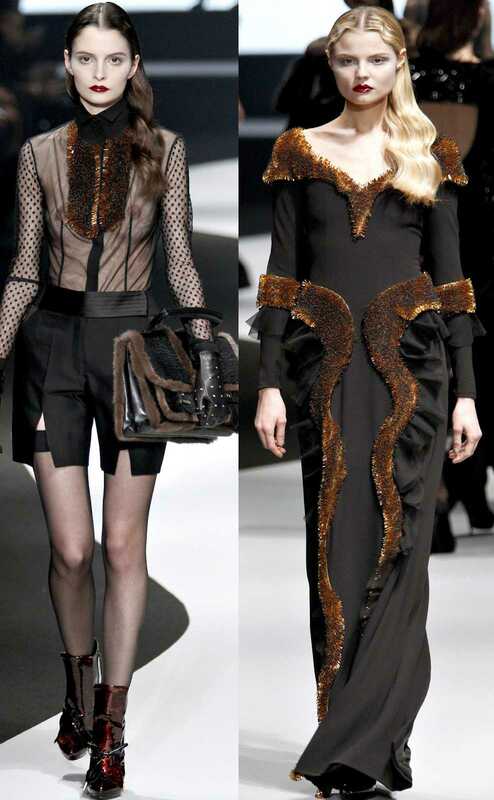 If you add Vintage to the mix, then you have grabbed all my attention, and that's what Viktor and Rolf's next Winter collection has done: a very dark glamorous collection depicting languid femme fatales dressed in misterious black outfits, trimmed with luxurious fur and vintage-style ruffles and tassels. "Soft, feminine, and romantic - with a little bit of mystery. Luke Leitch on Viktor & Rolf's chic moonlight-bathe, film-noirish collection." "The models had Rita Hayworth waves, almost consumptive pallors and the dark berry lips that have all been recurring themes in the film noir-tinted styling so popular this season." Antiqued brass bumble bee necklace with topaz jewel. Another item added to the website, a bug bracelet. 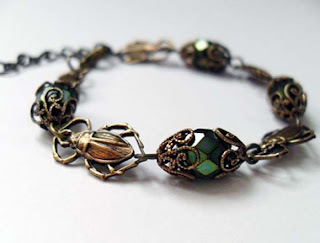 A beetle bracelet! What do you think? 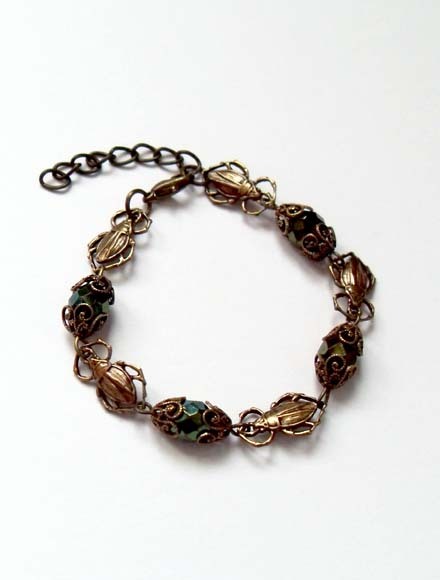 I decided to use metallic green czech glass beads, I think is a colour that would work very well with the bronze brass. Following my previous post, here are more pictures of another item I've added recently in my website. 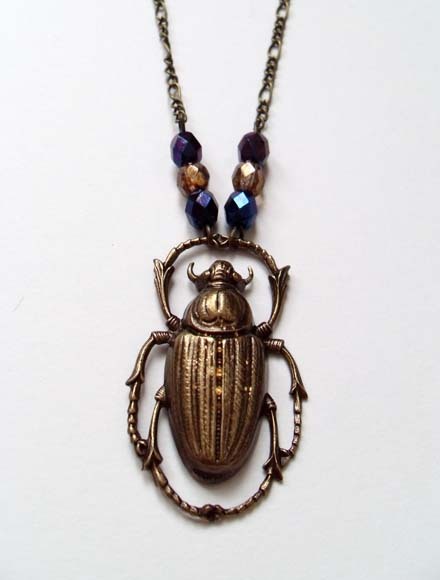 I know some poeple are obsessed with ancient Egypt or bugs in general, so I reckon this will soon become a favorite. What do you think?